I have followed in Anthony Bourdain’s footsteps before but never as closely as I did last night. This time it was unintended. When I planned an omakase dinner at Kihachi for my parents visit from England, I had no idea that we would be visiting the restaurant on the same day as Mr Bourdain would be there filming for his travel food show No Reservations. You would never guess from Chef Mike Kimura and this staff that this was a special day. It was all calm efficiency as usual. We learned about it initially from our neighbors at the bar. Of course we couldn’t resist asking Chef Mike what he had prepared for his special guest and what his impressions had been. I knew that Bourdain was in town speaking last night and I had heard a lot of speculation about where he would be eating and filming. 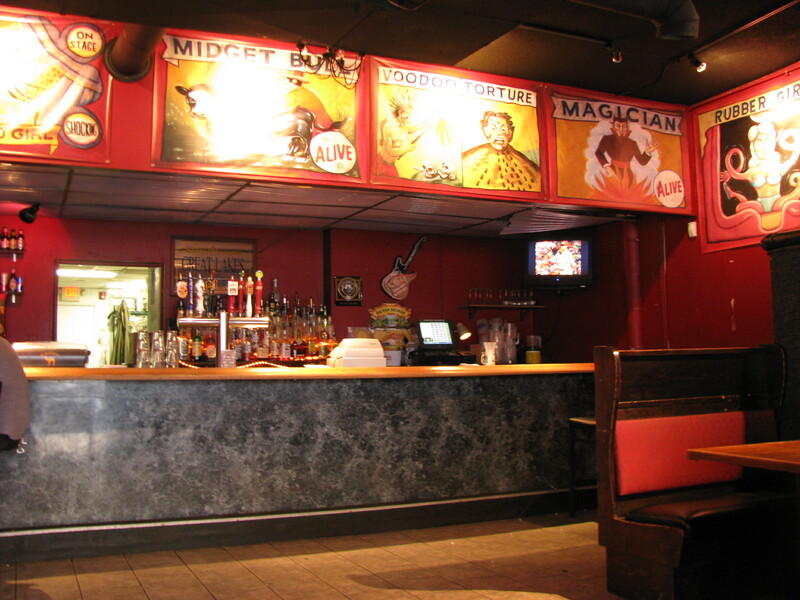 I am pleased that he chose to showcase one of Columbus’s finest restaurants. 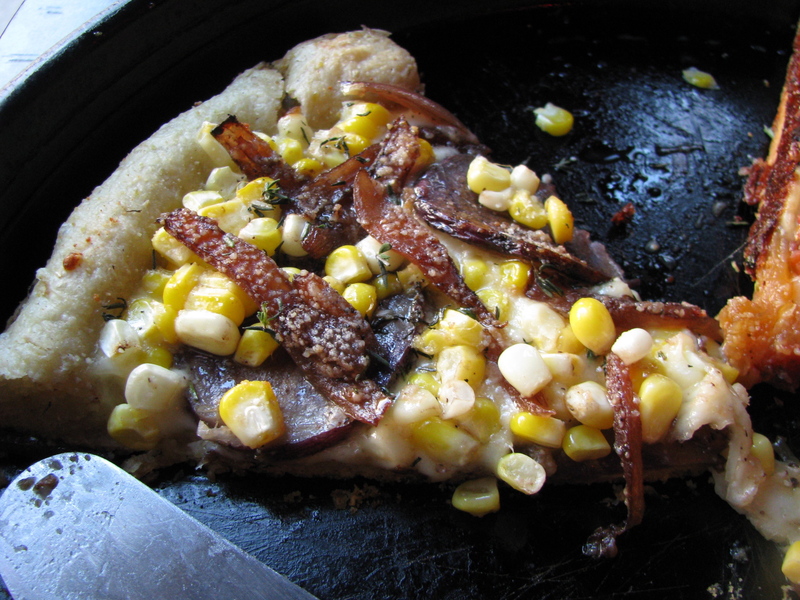 Often when I watch No Reservations I jealously wish that I could sample the amazing and intriguing concoctions. This time I could. We had 9 courses ( a couple short on Bourdain but more than enough) and almost everything was different to my last omakase there. 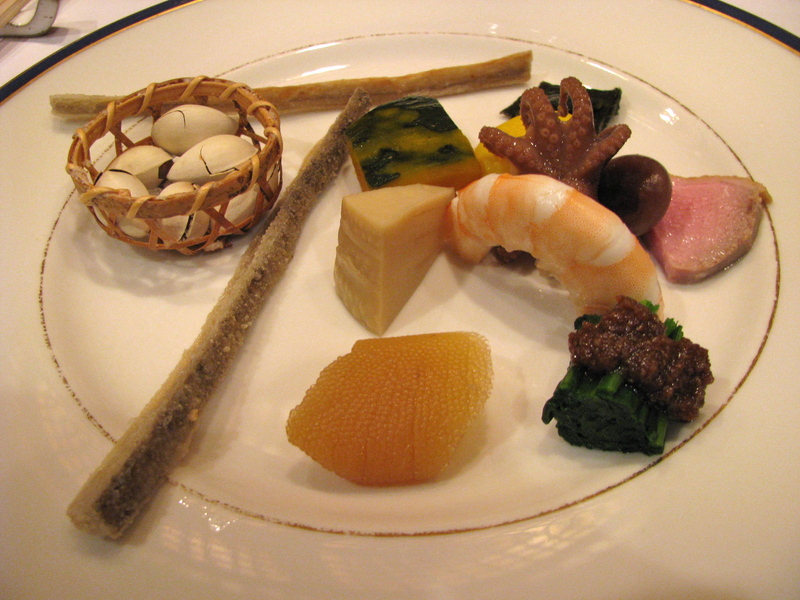 The first course was a trio of small tastes. The first was an instant home run. 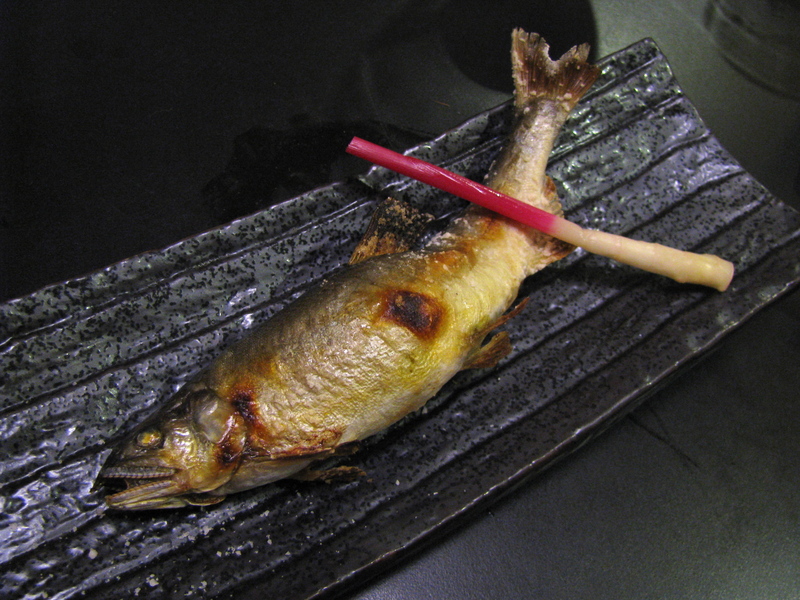 Wafer thin sea bream wrapped around lotus flowers with ponzu sauce. I instantly wanted more. 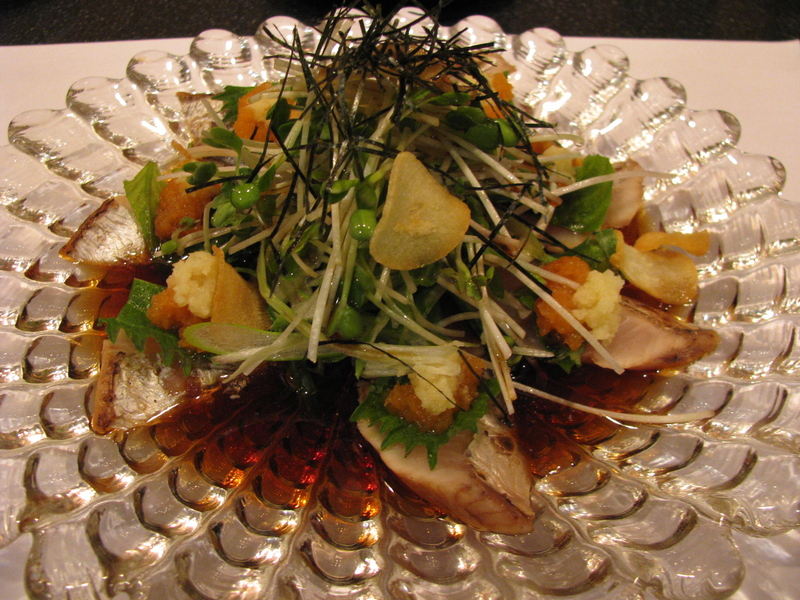 The center dish was herring roe with lightly dressed spinach and bonito flakes. The herring was a challenging flavor so the mild spinach was a good contrast. 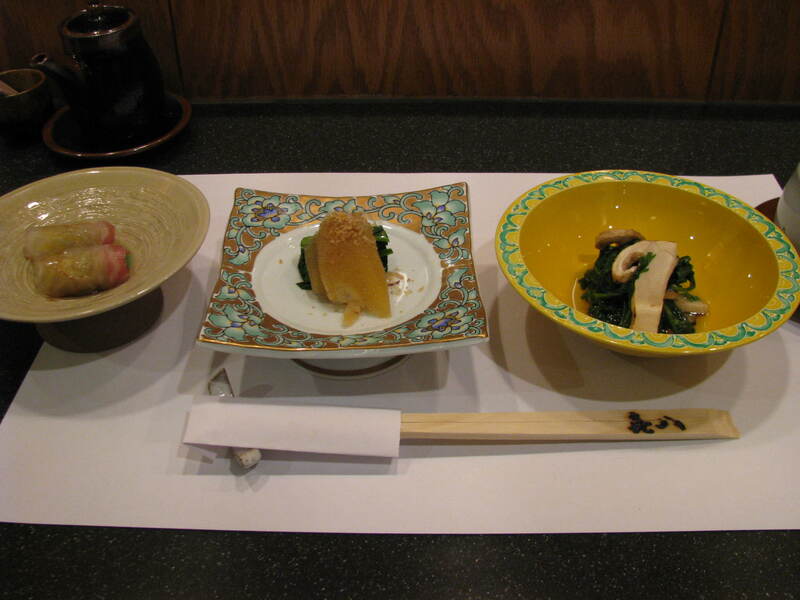 The third dish was a Japanese herb chilled and dressed and served with mushrooms. 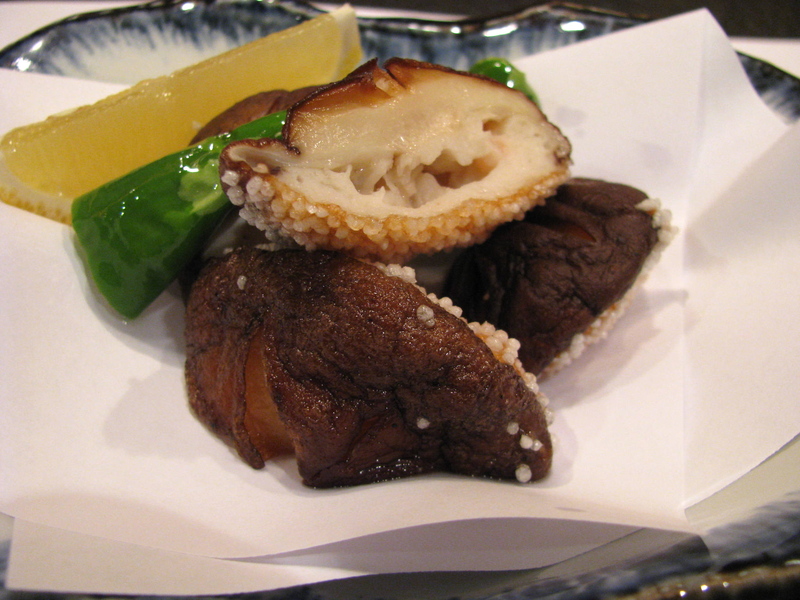 Autumnal matsutake mushrooms were a feature in many of the dishes in this meal. 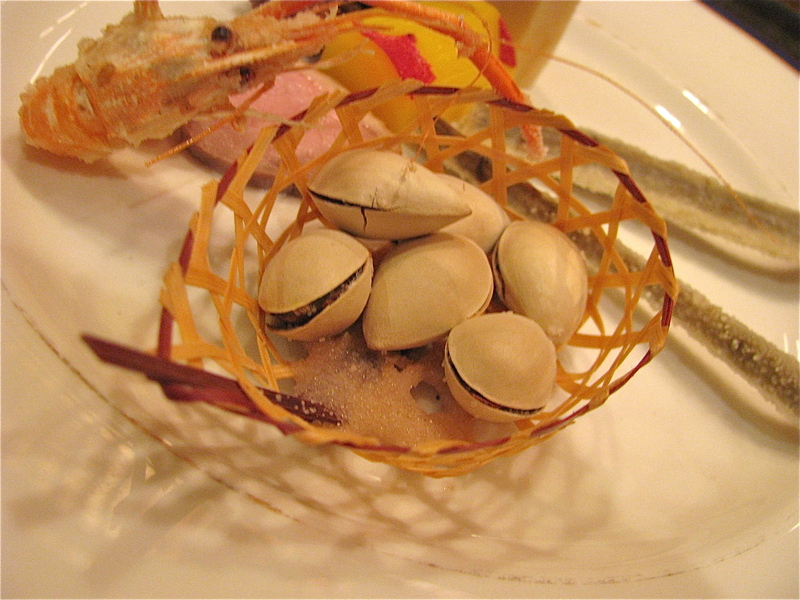 The second course was an assortment of appetizers with salted gingko nuts, deep fried burdock root (gobo), a fresh water shrimp, a slice of steamed duck breast, bamboo shoot, a citrusy marinated sweet potato and slow cooked baby octopus. Sitting at the bar we had fun watching the ginkgo nuts being tossed in a large skillet of salt. Chef Mike answered a lot of questions about how each was prepared, patiently listing the ingredients in each marinade. 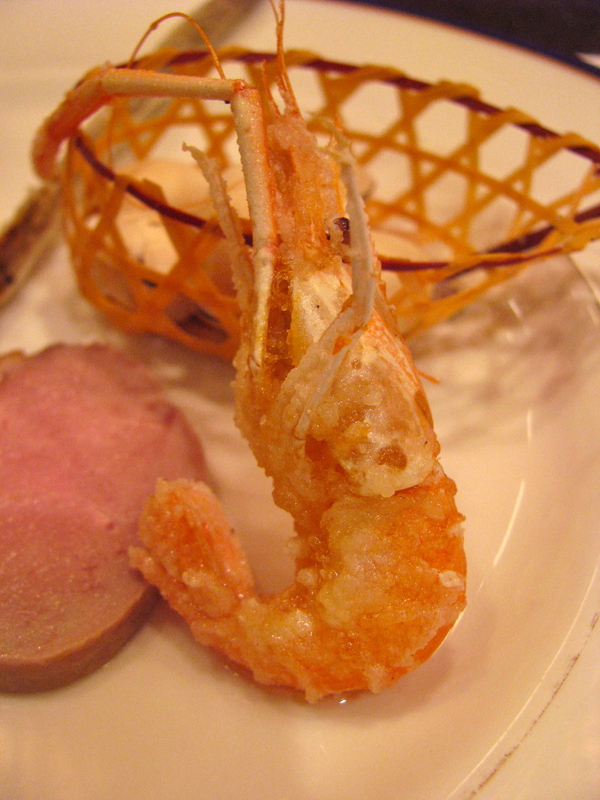 The freshwater shrimp, eaten whole, is as light and crispy as popcorn and like popcorn you could eat a whole bowl. 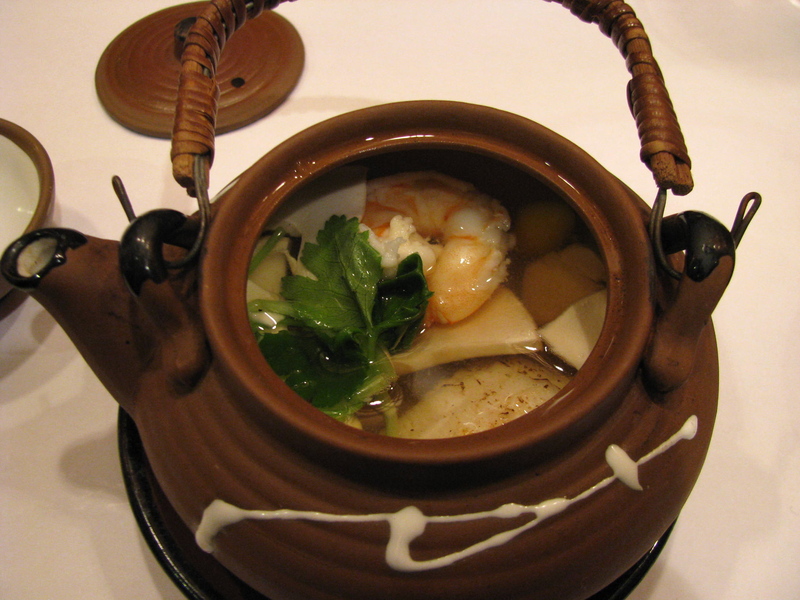 Our next course was a clay pot soup with mushrooms, ginkgo nuts, fresh water eel, mitsuba and shrimp. 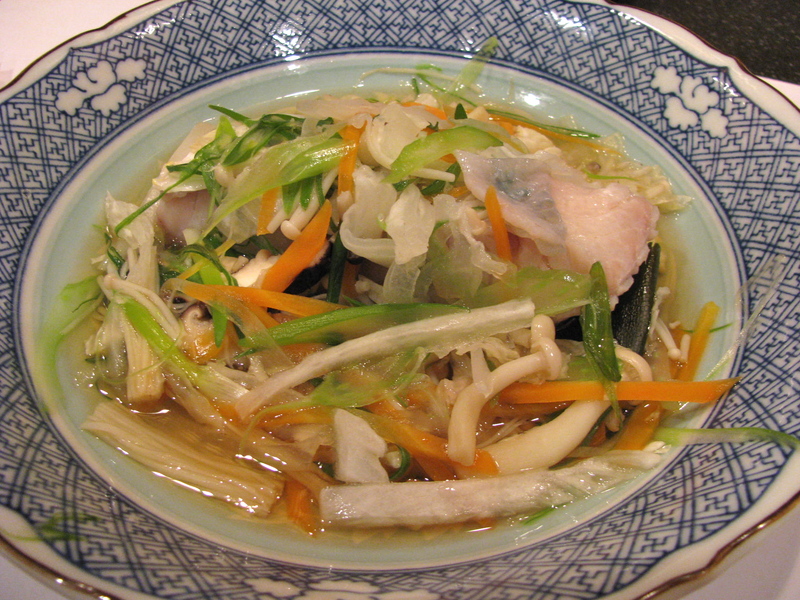 The broth was extremely well balanced without any dominant flavor and was perfectly seasoned. 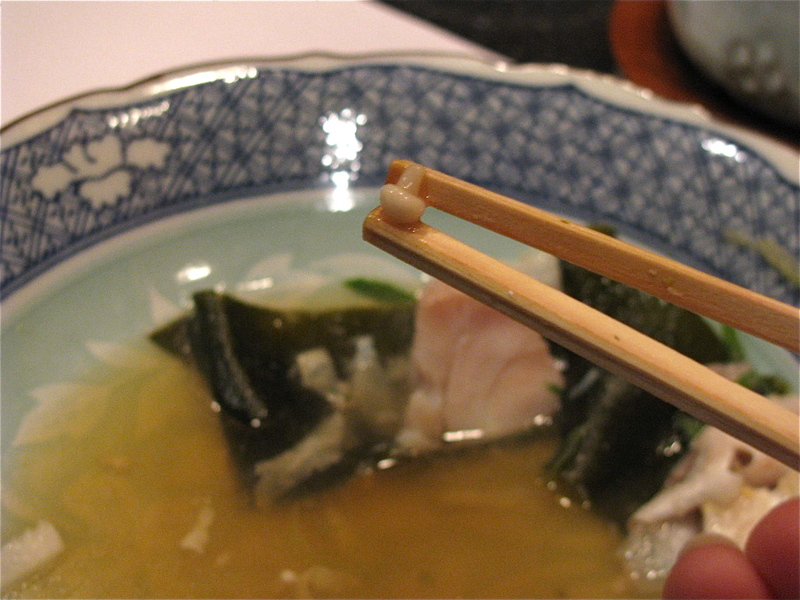 You pour the broth into a tiny cup and use your chopsticks to delve for the delicacies inside the pot. 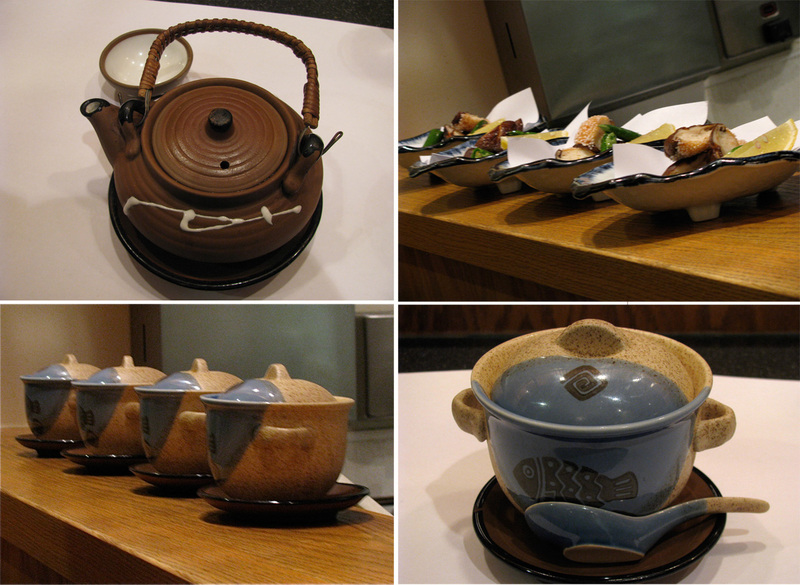 The pots are steamed before serving and so the soup remains hot much longer than it would in a bowl. 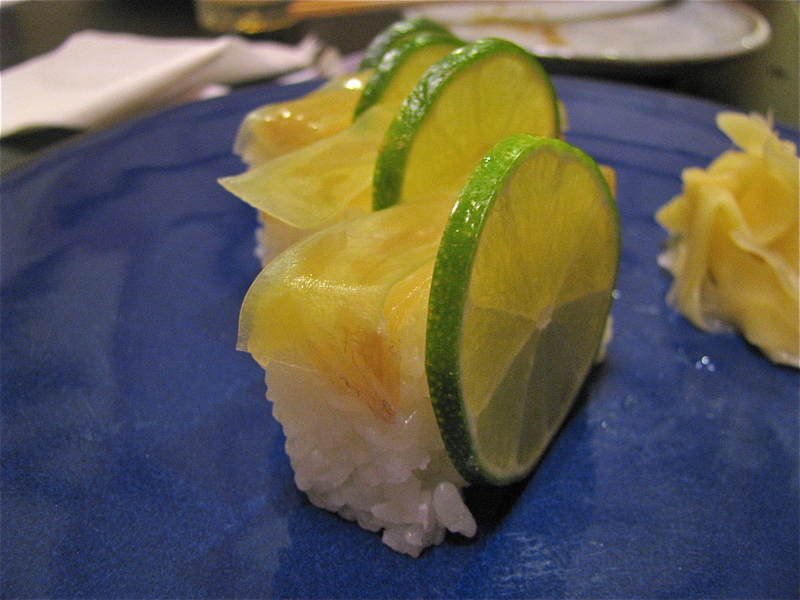 The misuba and a squeeze of lime are added just before serving. 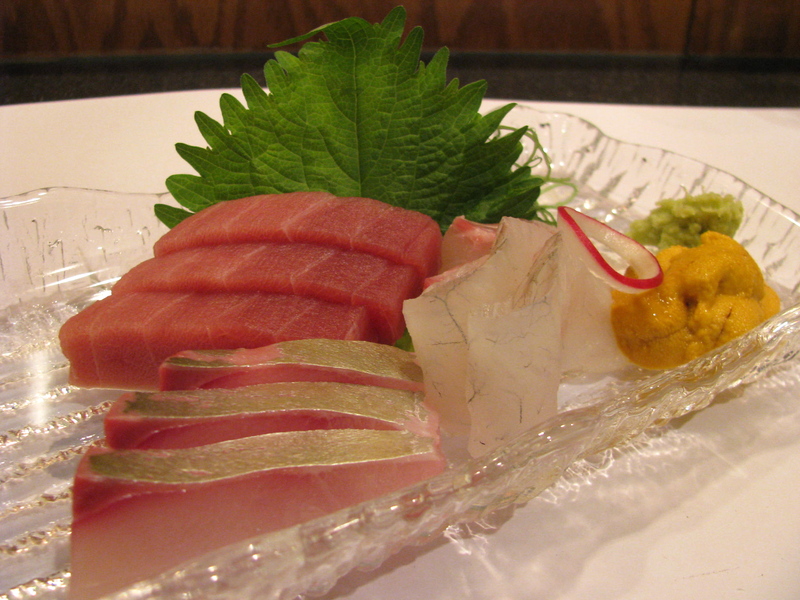 The sashimi course was a beautiful array of tuna, jack fish, fluke, sea bream and sea urchin (uni) accompanied by fresh wasabi, seaweed and an aromatic shiso leaf. 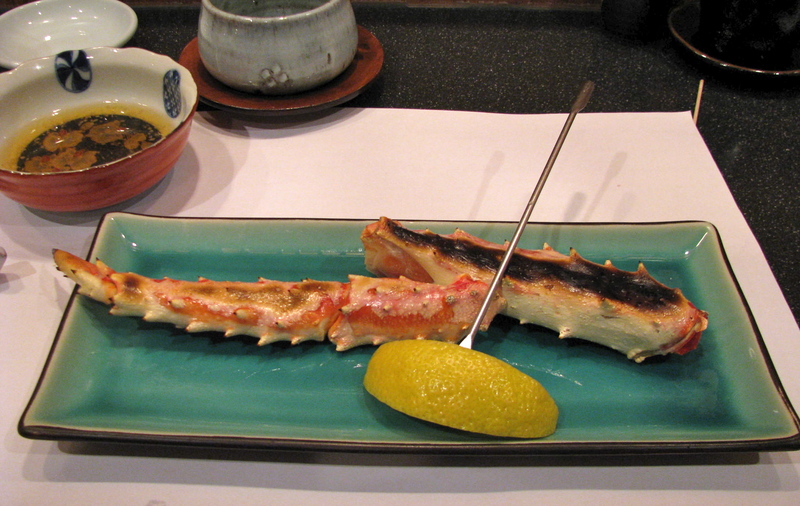 Both the tuna and sea urchin were among the best I have had – melting buttery mouthfuls that need no accompaniment. 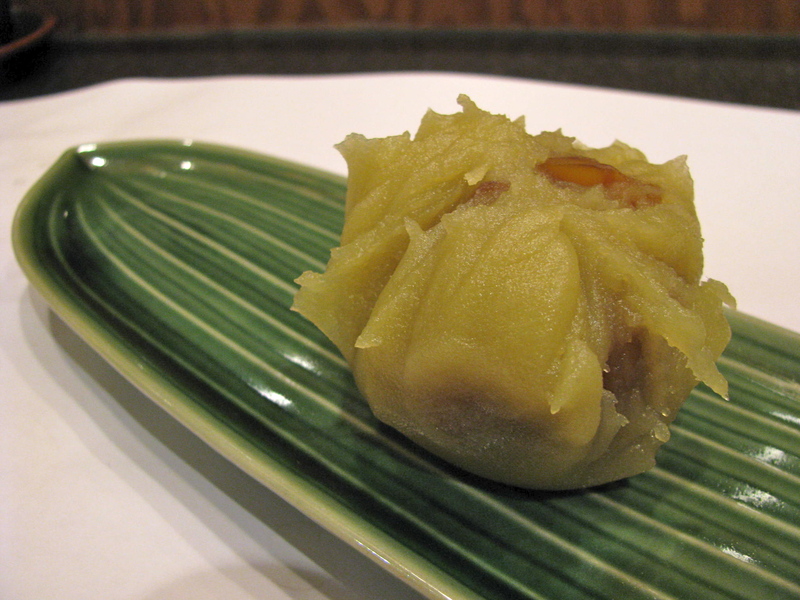 This dish was a fried dumpling containing chopped lotus root and fresh water eel topped with wasabi in a dashi broth. 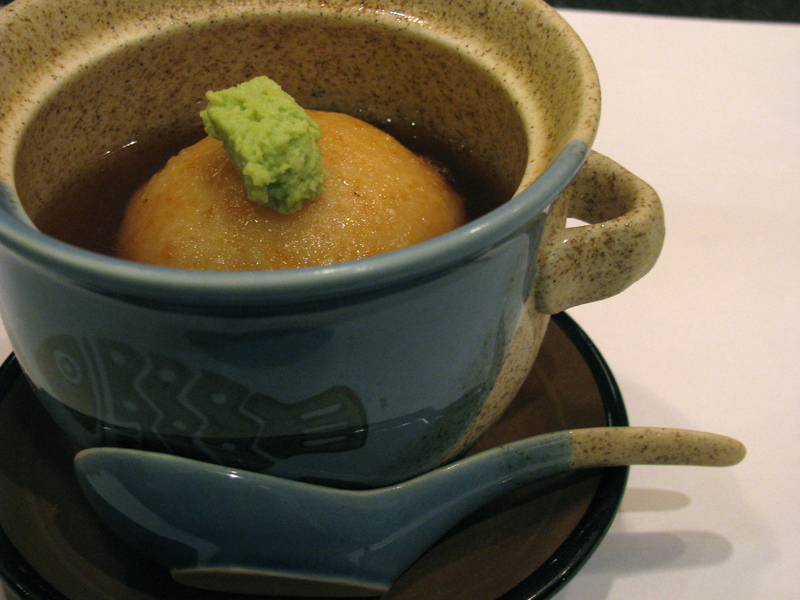 We were told to break the ball with our chopsticks and mix the wasabi into the broth. 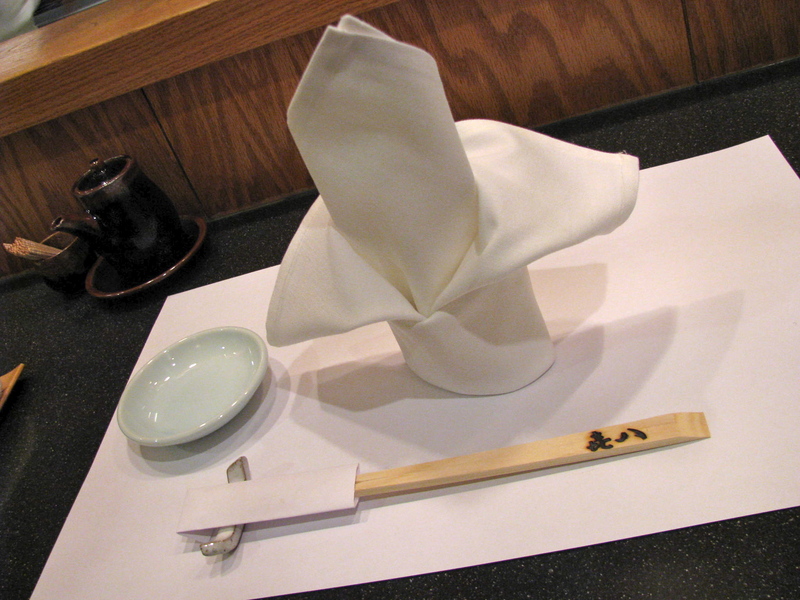 With hindsight it might have been better to be a little more conservative with the wasabi. The dish was an interesting combination of textures with the crunchy lotus root, liquid broth and dissolving dumpling. It was at this stage that my parents nervously started asking how many courses were left. Already beyond sated there were fears that they would not be able to finish or adequately enjoy the rest of the food. 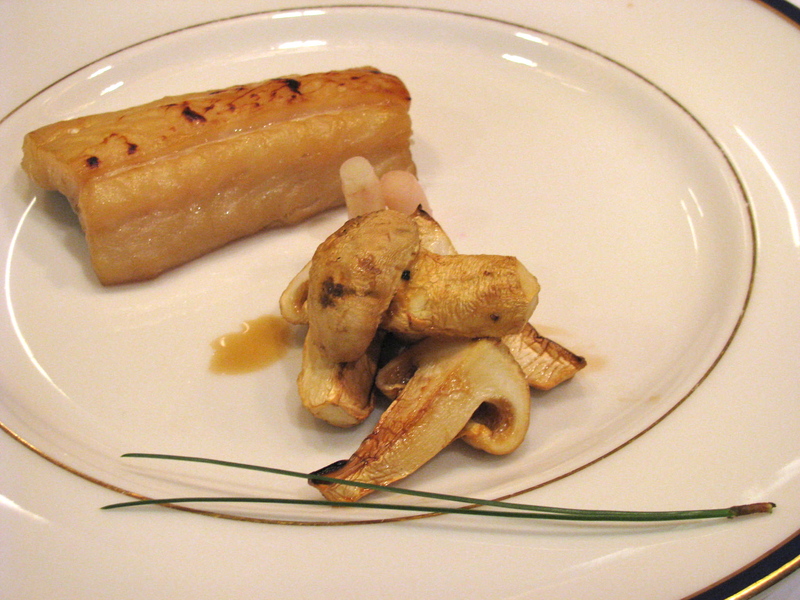 Course number six was a succulent piece of grilled fish (I believe sea perch) with more of the precious matsutake mushrooms and some pickled ginger. 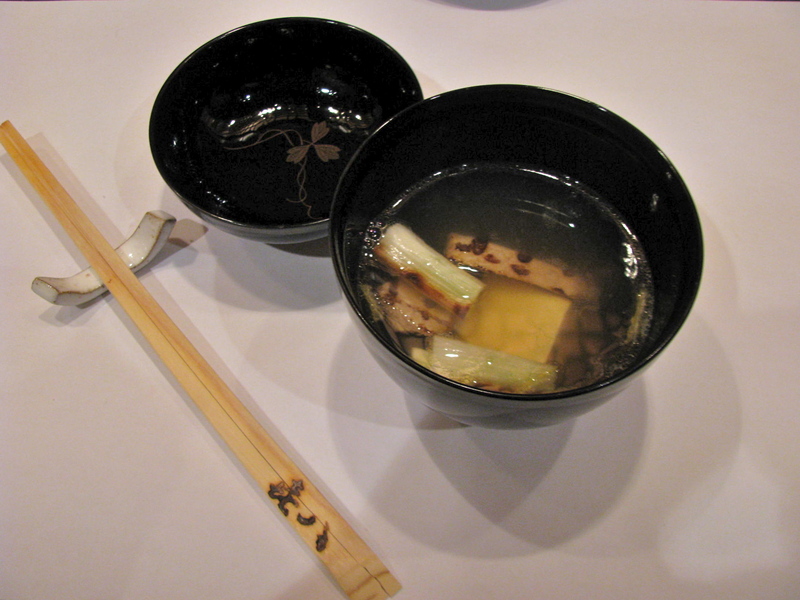 Matustake mushrooms are found under old Japanese red pine trees – which explains the garnish. This was followed by shrimp stuffed shitake mushrooms with deep fried green chilis and a delicate dipping sauce. 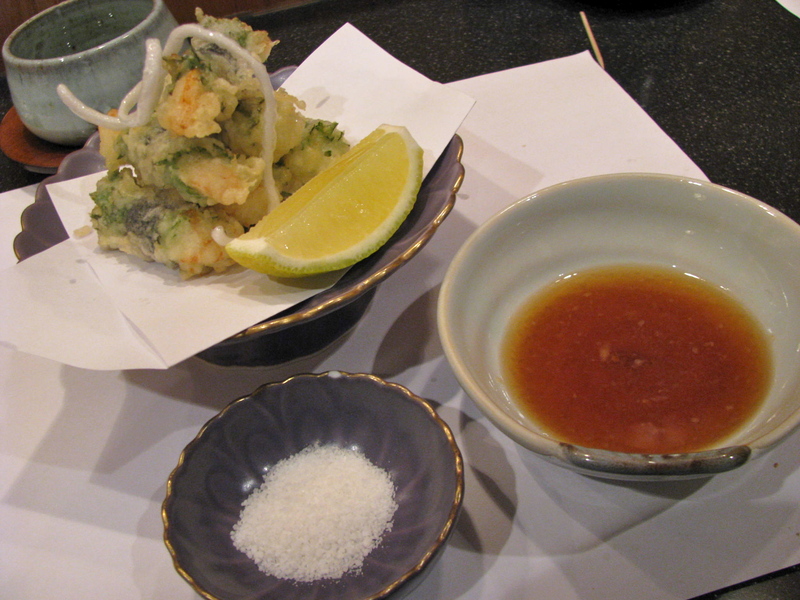 The crunchy bubbly coating, which looks like tiny beads, is created by rice flour. 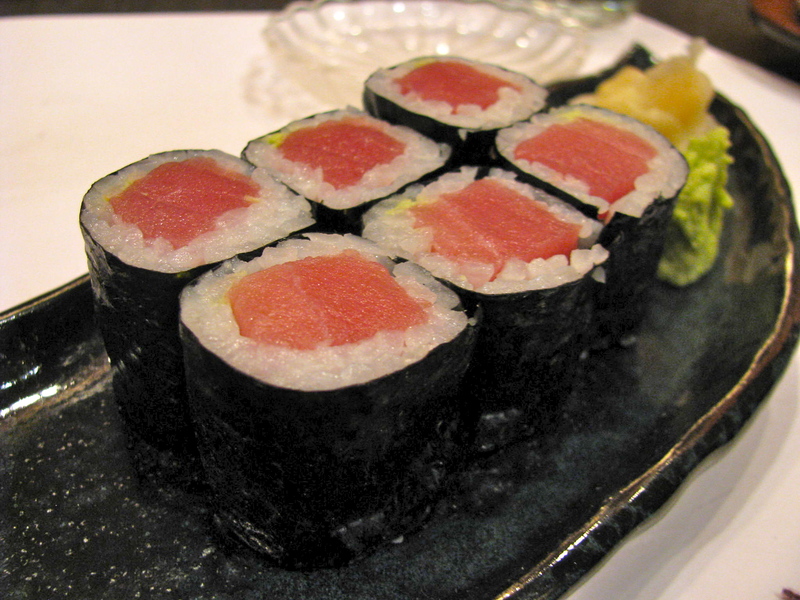 The penultimate course was a classic crowd pleaser: tuna rolls with the same mouth watering sushi that had featured in the sashimi. 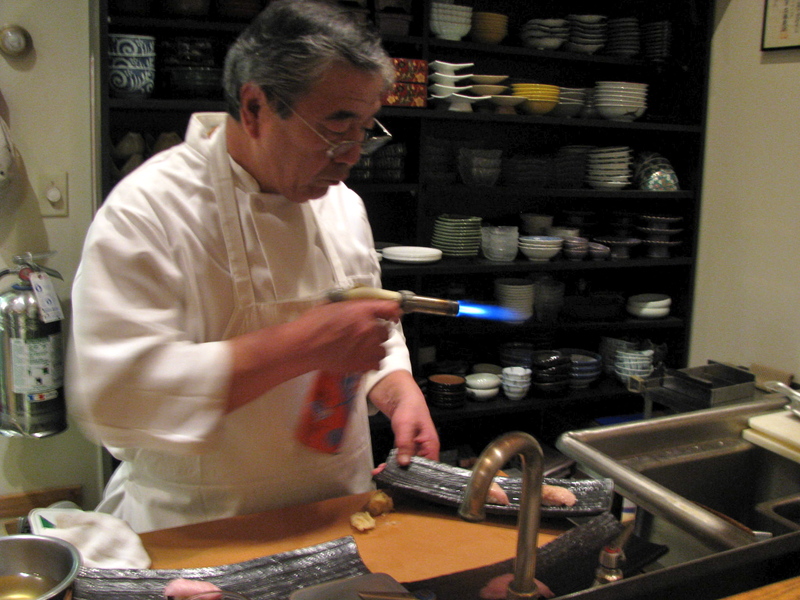 I love to to admire the talented chefs in action, their knife skills never fail to amaze me. 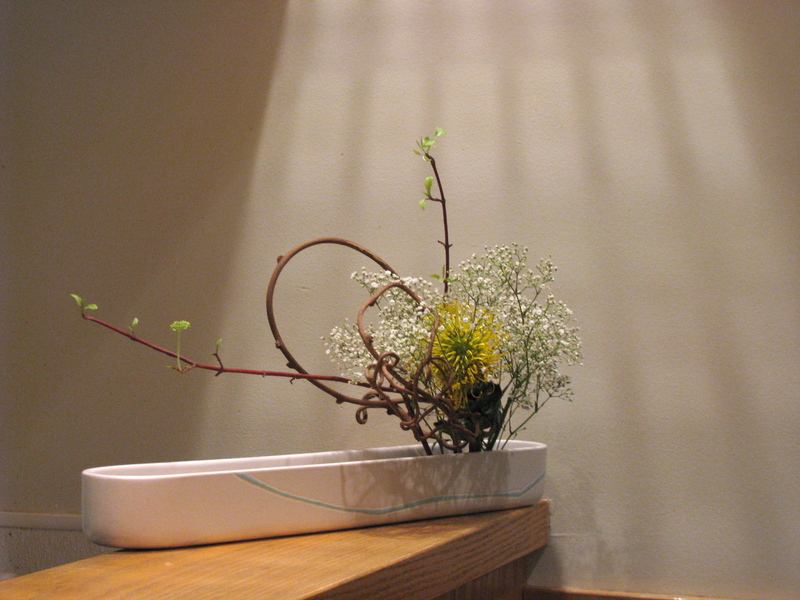 The food is always beautiful but the artistry of their compositions in no way detracts from the taste. Styling never takes precedence over substance. 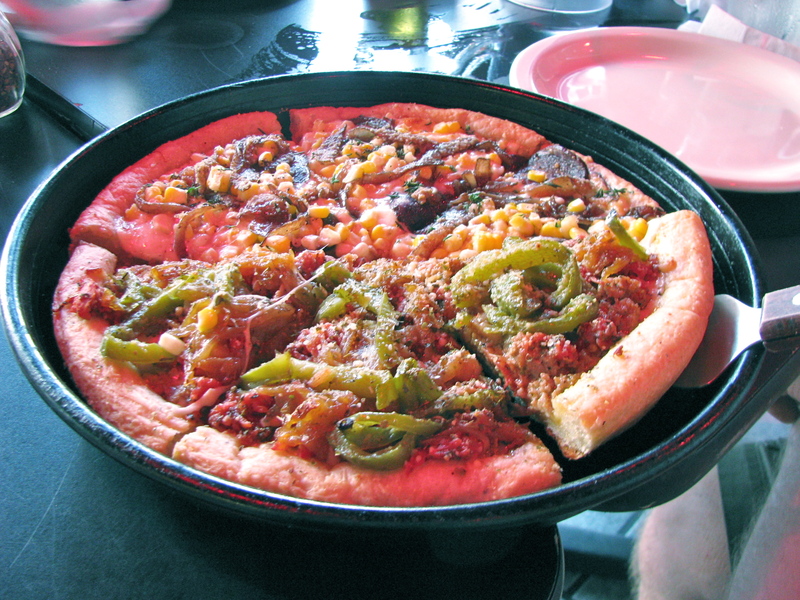 The flavors may range from challenging to comforting to revelatory but are they always well balanced and the pride in ingredients is evident. Despite the precision and painstaking attention to detail the passion of the chefs is still evident. 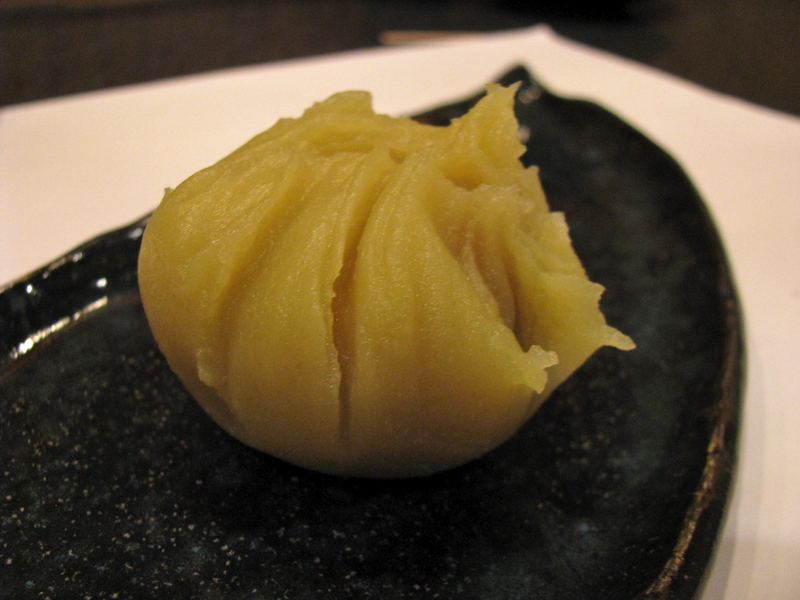 Our meal finished with kuri kinton, a dessert of mashed sweet potatoes with chestnuts served chilled. Sweet, creamy, earthy and nutty, none of us had trouble finding room for this delicious finale. 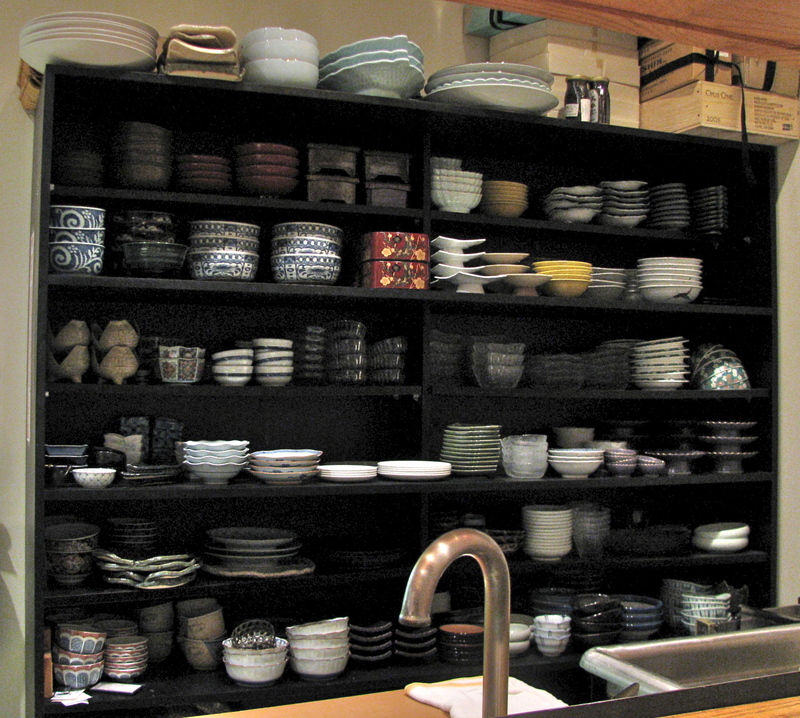 I gather that the No Reservations episode featuring Kihachi will air sometime in the spring. I hope Bourdain enjoyed his meal as much as we did. 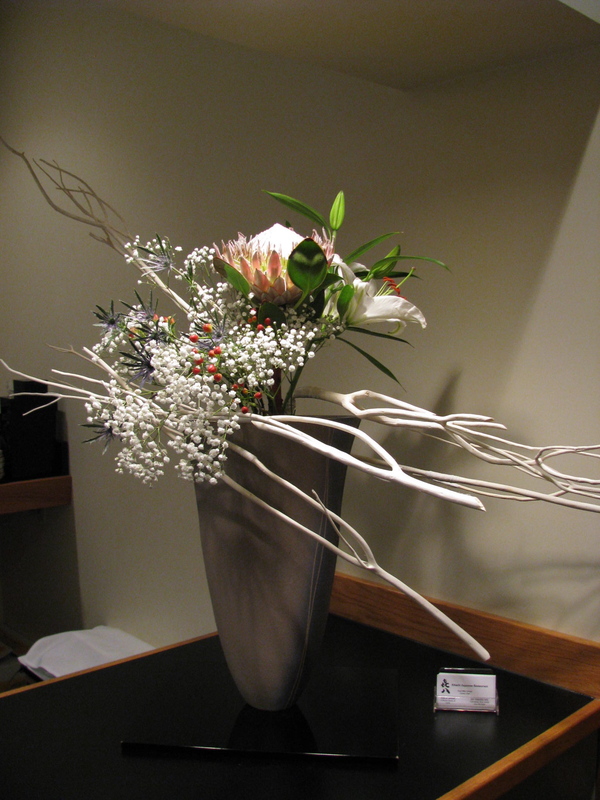 Kihachi can be found at 2667 Federated Blvd, Columbus, Ohio. 614 764 9040. 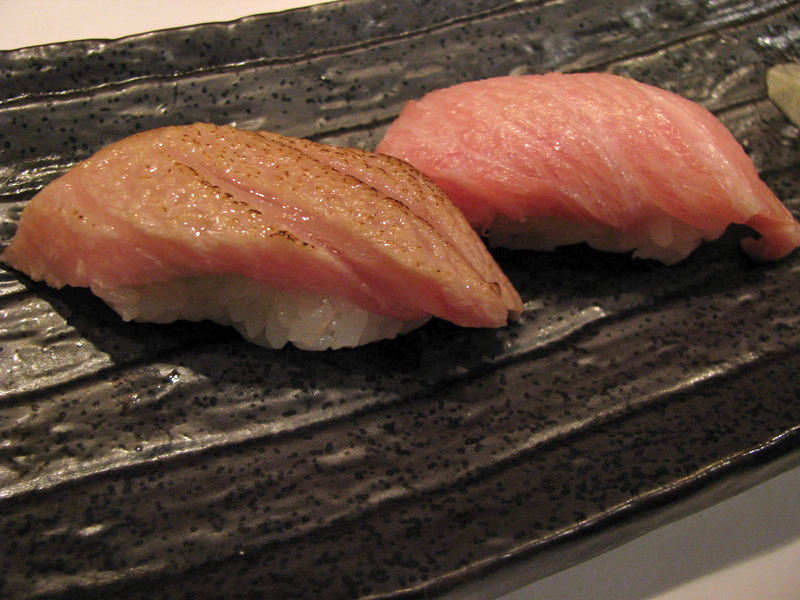 Omakase dinners need to be booked at least 24 hours ahead. 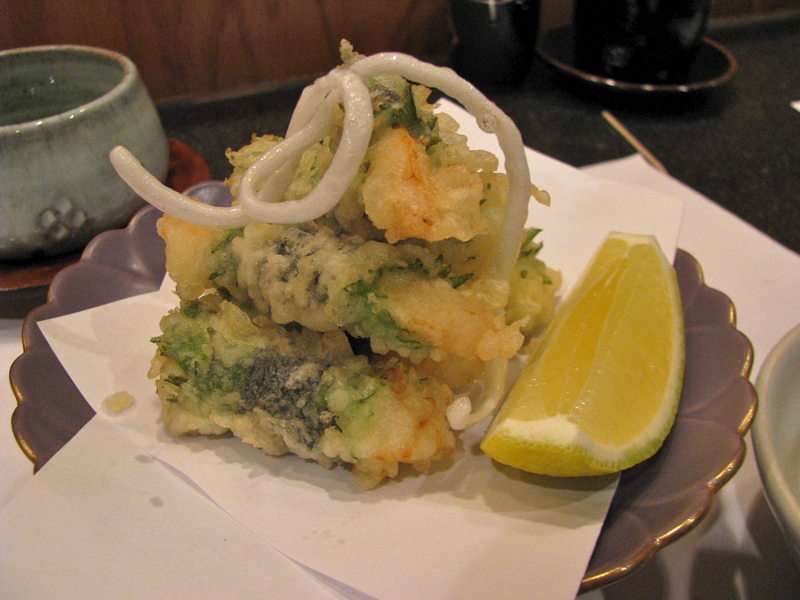 While I was looking up a couple of ingredients for this post I found a great Japanese food glossary.